Payment is due on day of your lesson. If you must cancel notify the school as soon as possible. Payment can be made by e-transfer, debit, cheque or cash. Founded in 1984 by LPGA champion Sandra Post, the Sandra Post Golf School has grown to be recognized as one of Canada’s most respected golf schools. Exceptional instruction is provided for ALL skill levels from new to seasoned golfers with a focus on the individual’s natural ability and commitment in order to build a better understanding of the golf game. All classes stress the basic fundamentals of the game as well as golf exercises and the selection of proper equipment. We offer Level 1, 1A, 2, and Short Game workshops. A clear description of each of these classes can be found under the Golf Lesson tab. All classes are taught by 49 year LPGA Life Member Sandra Post. 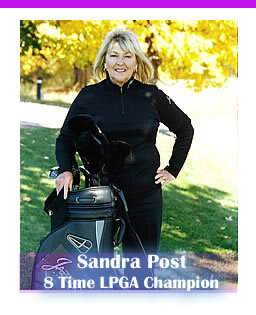 The Sandra Post Golf School is located at Glen Eagle Golf Club, 5k north of Bolton on Highway 50. Classes are conducted from March through October. The practice facility at Glen Eagle Golf Club includes a public range, putting greens, bunkers and a short game area. In addition, there is a designated 4 hole practice course for the Golf School students only. Glen Eagle Golf Club is a welcoming, picturesque and well-maintained 27 hole course complete with a pro shop and dining facilities. To register for all lessons contact us above or call 905 533-1330.